TOKYO, November 22, 2018 - Mitsubishi Electric Corporation (TOKYO: 6503) and NTT DOCOMO, INC. (TOKYO: 9437) announced today that they have achieved what they believe to be the world's first (as of today) fifth-generation (5G) mobile telecommunications proof of concept for 27Gbps and 25Gbps maximum throughputs via one mobile terminal over communication distances of 10m and 100m, respectively, using the 28GHz radio frequency. The demonstration was conducted during joint outdoor field trials using 28GHz-band massive-element antenna systems and 16-beam spatial-multiplexing technology with 500MHz bandwidth. The trial took place in Kamakura, Kanagawa Prefecture Japan from September 10 to 28, 2018. For outdoor trials using the 28GHz band, Mitsubishi Electric used an antenna system with 16-beam spatial-multiplexing technology1. Base-station antennas installed on the wall of a building directed beams to mobile-terminal antennas installed on the rooftop of a vehicle. The trial was the world's first successful wireless downlink transmission at maximum data rates of 27Gbps and 25Gbps for per one mobile terminal when the communication distance was 10m and 100m, respectively. Mitsubishi Electric and DOCOMO have jointly undertaken "The research and development project for realization of the fifth-generation mobile communications system - High data rate and low-power-consumption radio access technologies with higher-frequency-band and wider-bandwidth massive MIMO" commissioned by Japan's Ministry of Internal Affairs and Communications. The focus of their research has been wideband massive MIMO and beam-control technologies for high SHF bands. To realize 20Gbps throughput using 500MHz bandwidth, they have now collaboratively developed and validated a massive-element antenna system enabling 16-beam spatial multiplexing. Using 4G systems, it has not been possible to establish high data-rate communication for a single mobile terminal using more than four streams. 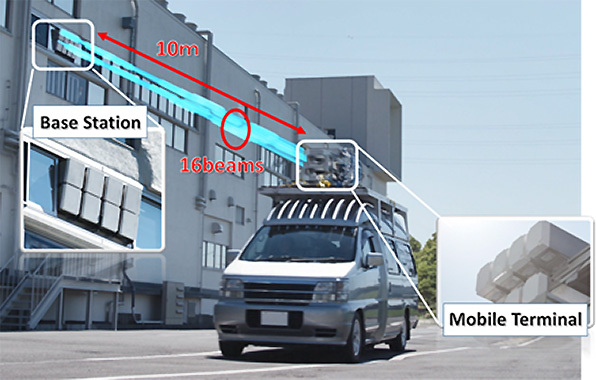 Mitsubishi Electric and DOCOMO carried out 28GHz-band outdoor field trials to verify the feasibility of 16-beam spatial multiplexing in line-of-sight conditions4, where massive-element base-station antennas installed on the wall of a building directed beams to mobile-terminal antennas installed on the rooftop of a vehicle. The mobile terminal moved along two different streets. The distance of one mobile terminal was 10m from the base station and the distance for the other was 100m (Fig. 1). This news release includes a part of "The research and development project for realization of the fifth generation mobile communications system" commissioned by Japan's Ministry of Internal Affairs and Communications. The trials achieved the world's first successful wireless downlink transmissions at data rates of 27Gbps and 25Gbps when the distance between the base station and the mobile terminal was 10m and 100m, respectively. The achieved peak data rates correspond to spectral efficiency of 67bps/Hz5, believed to be the world's best performance for 28GHz-band mobile telecommunication. 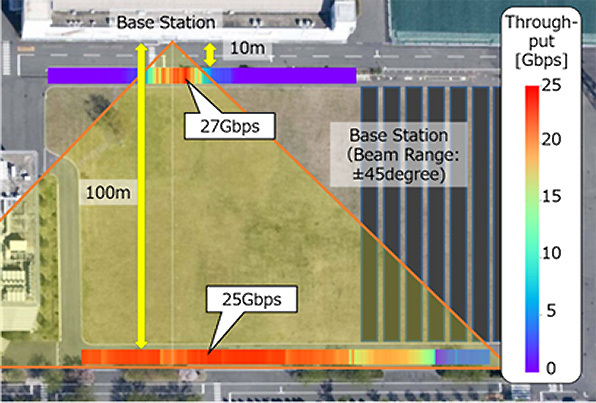 The test achieved the goal of the Japanese government's research and development project to help realize 5G mobile communications based on high data-rate and low-power-consumption radio-access technologies and using an ultra-high-frequency band and extra-wide-bandwidth massive MIMO. The developed technologies are expected to enable wireless communications at ultra-high data rates of more than 20Gbps to moving vehicles with numerous passengers, such as buses. There was no obstacle between the base station and device. The environment for parallel transmission was challenging.